On our final full day in Palestine, we spent the morning and afternoon in the Jenin refugee camp. 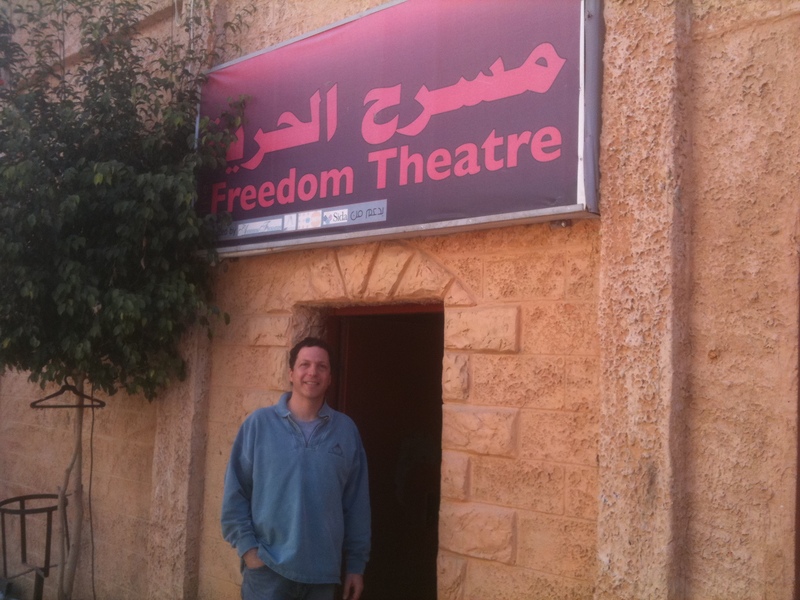 Our first stop was the Jenin Freedom Theatre. The Freedom Theatre was founded by Israeli political and human rights activist Arna Mer Khamis in the wake of the First Intifada. 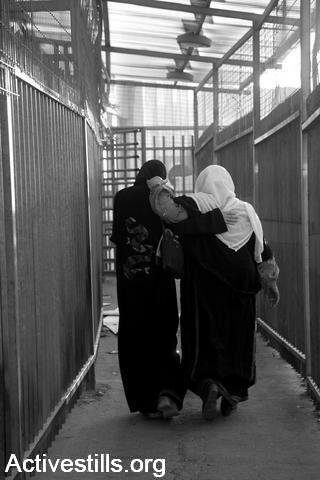 Arna’s project used theater and arts to address Jenin’s childrens’ trauma, chronic fear and depression that resulted from the violence of the Intifada and the Occupation. Arna passed away in 1995 and her work has since been carried on by her son Juliano. The Freedom Theatre’s theater building was destroyed during Israel’s military invasion of the Jenin refugee camp in 2002. It was rebuilt in 2007 and now flourishes with an array of amazing programs, performances and cultural events. What makes the Freedom Theatre truly special is at the end of the day, it is about Palestinian solidarity – not simply another example of coexistence, dialogue or Israeli noblesse oblige. All who work at the Theatre, whether they are Palestinians, Israelis or internationals understand that above all, the Freedom Theatre is a form of Palestinian cultural resistance. As part of our tour, we viewed these two films (at top and below) about the Theatre’s work. The films elicited a deeply emotional reaction from our group. When you will watch them you will understand why – and why we must learn about and support invaluable projects such as this. After our visit, we toured the refugee camp, which has only partially been rebuilt since the Israeli military invasion in 2002. We then boarded the bus for our ride back to Jerusalem. When we arrived at Bethlehem (though we technically didn’t need to) we got off the bus and walked through the checkpoint in order to get a first hand look at this daily, signature Palestinian experience. We had the luck of arriving before rush hour – and of course of being American tourists who were undoubtedly being given preferential treatment by the IDF. We waited in line and eventually arrived at a long, narrow chute that forced us into single file. One by one, we filed through a huge steel turnstile, which locked frequently with the flash of a red light and a loud buzzer. Once through the turnstile, were in a kind of an antechamber, in which soldiers spoke to us through a loudspeaker from a control room on the other side of thick glass. We were instructed to put our packs and metal objects on a conveyor belt/x-ray machine, and eventually emerged on the other side. 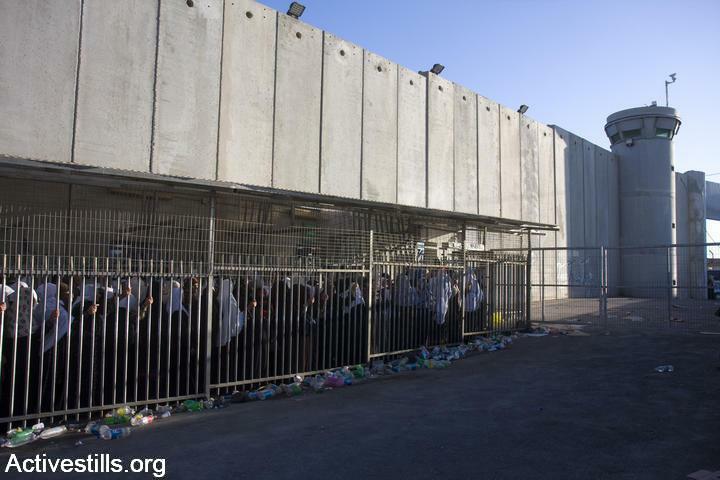 Those who have never seen an Israeli checkpoint cannot fathom how massive and extensive they are. This is something far beyond a mere road block or airport security line. Everything about this experience reminds you of your abject disempowerment; of the fact that you are utterly, frighteningly at the mercy of an armed power much greater than yourself. It was impossible for us to begin to comprehend what it must do to Palestinians who has to endure such humiliation on a daily basis. And again: we weren’t even asked to disrobe, step away form the line, or wait for literally hours on end. Stay tuned for some guest posts and final thoughts. This entry was posted in Human Rights, Israel, JRC I/P Study Tour 2010, Palestine on December 29, 2010 by Rabbi Brant Rosen. I have been following all your posts from the trip, but did not have a chance to comment till today!!! That boy in the first video said he wishes that his “death would be natural”…what a wish!!! !